TOKYO—The death toll from unprecedented rains in Japan rose to at least 64 on July 8 after rivers burst their banks and forced several million people from their homes, media reports said, with more rain set to hit some areas for at least another day. Torrential rains pounded some parts of western Japan with three times the usual precipitation for a normal July and set off landslides and sent rivers surging over their banks, trapping many people in their houses or on rooftops. At least 64 people were killed and 44 missing, national broadcaster NHK said after the death toll had been put at 49 overnight. Among the missing was a 9-year-old boy believed trapped in his house by a landslide that killed at least three others, one of them a man in his 80s. “All I have is what I’m wearing,” a rescued woman clutching a toy poodle told NHK television. “We had fled to the second floor but then the water rose more, so we went up to the third floor,” she said. 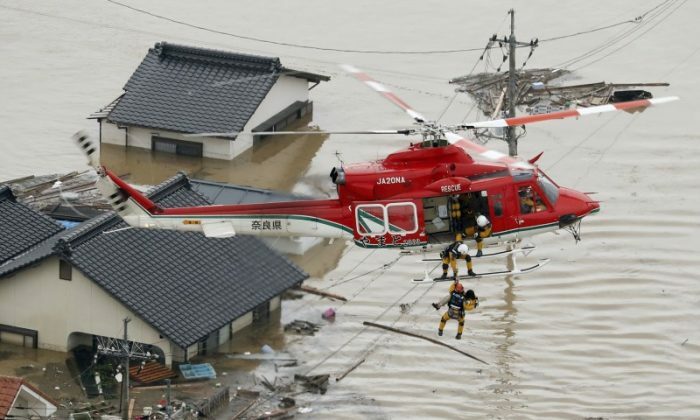 Japan’s government set up an emergency management center at the prime minister’s office and some 54,000 rescuers from the military, police, and fire departments were dispatched across a wide swath of southwestern and western Japan. Emergency warnings for severe rain remained in effect for three prefectures, with 11 inches predicted to fall by Monday morning in parts of the smallest main island of Shikoku. Evacuation orders remained in place for some 2 million people and another 2.3 million were advised to evacuate, although the rain had stopped and floodwaters receded in some areas. Landslide warnings were issued in more than a quarter of the nation’s prefectures. The rain began late last week as the remnants of a typhoon fed into a seasonal rainy front, with humid, warm air pouring in from the Pacific making it still more active—a pattern similar to one that set off flooding in southwestern Japan exactly a year ago that killed dozens. The front then remained in one place for an unusually long time, the JMA said. Roads were closed and train services suspended in parts of western Japan. Shinkansen bullet train services, resumed on a limited schedule after they were suspended on Friday. Automakers including Mazda Motor Corp and Daihatsu Diesel Manufacturing Co suspended operations at several plants on Saturday due to a shortage of parts or dangerous conditions. They were set to decide later on Sunday on plans for the coming week. Electronics maker Panasonic Corp said one plant in Okayama, western Japan, could not be reached due to road closures, although it had been closed for the weekend anyway. A decision about next week would be made on Monday. While the Japanese government monitors weather conditions closely and issues warnings from an early stage, the fact that much of the country outside of major cities is mountainous and building takes place on virtually every bit of usable land leaves it vulnerable to disasters. Reforestation policies after World War Two that saw many mountains logged and replanted with trees whose roots are less able to retain water have also contributed to the danger.